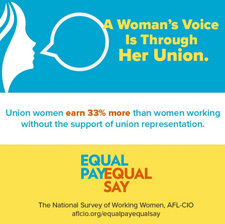 Equal pay for equal work is at the top of the list of economic concerns for working women, according to the AFL-CIO’s recently released National Survey Study of Working Women. The survey of over 23,000 working women found that gender pay inequality beat out 20 other social and economic issues facing women today. Rounding out the top five issues were affordable health care, guaranteed health care for all, affordable higher education, and raising the minimum wage. Women surveyed identified health care costs as their top barrier to economic stability, followed by low wages, cost of higher education and student debt, unpredictable work schedules and personal debt. The majority of respondents were the main breadwinners in their household. Nearly six in 10 of women surveyed said they earn a majority of their household income. The AFL-CIO is releasing the findings in a series of short reports over the next few months. The first issue, Our Voices: A Snapshot of Working Women, provides a snapshot of the entire sample.